"I spent my happiest hours wandering alone by shore or hill or wood." For the past five years, I've lived near the foot of the Niagara Escarpment, just minutes from the James Street Stairs, which connect downtown to the "mountain." I don't spend enough time exploring my own neighbourhood, so the Victoria Day long weekend seemed like the perfect opportunity. With a coffee from my favourite local coffee shop — Red Crow — in hand, I began my trek up the stairs, which were surprisingly free of joggers and fellow wanderers, giving me lots of opportunity to stop to take pictures. From the stairs, the supports from the Hamilton and Barton Incline Railway, also known as the James Street Incline, are still visible. The railway, which carried passengers and wagons, to the top of the escarpment began operation in 1892. A trip up the incline railway took approximately 75 seconds. However, the rise of the automobile and the building of roads up the escarpment led to the railway's demise in 1932. 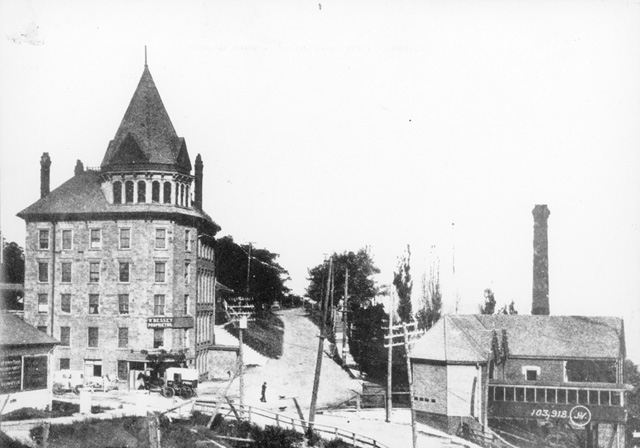 At the top of the James Street Stairs is Southam Park, which was formerly the home of the Mountain View Hotel. The park is named after the Southam family, who purchased the property before the hotel was demolished around 1940. The family donated the property to the city in 1944 under the promise that it would be designated as a park. Today, Southam Park boasts a beautiful view of the city and also houses a fountain dedicated to Major Gordon Southam who died in the Battle of the Somme during World War I. After spending some time wandering Southam Park and the mountain brow, I slowly made my way back down the mountain, exploring some paths along the way. This house on James Street South is an early work by James Balfour, who also designed Treble Hall. That sure is a beautiful place. It reminds me of Mill Mountain, Roanoke, Virginia. A city with a nice mountain park and trails near-by. Roanoke at one time had an incline to the top of Mill Mountain, but it does not have such a beautiful park and rocks. Nice view of Lake Ontario.